Breakfast is an important meal in our home and I try to incorporate healthy ingredients into the first meal of the day. 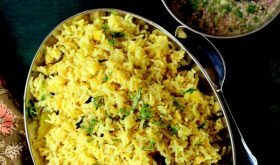 Not only does the dish have to be healthy but it should be quick and simple to prepare too. 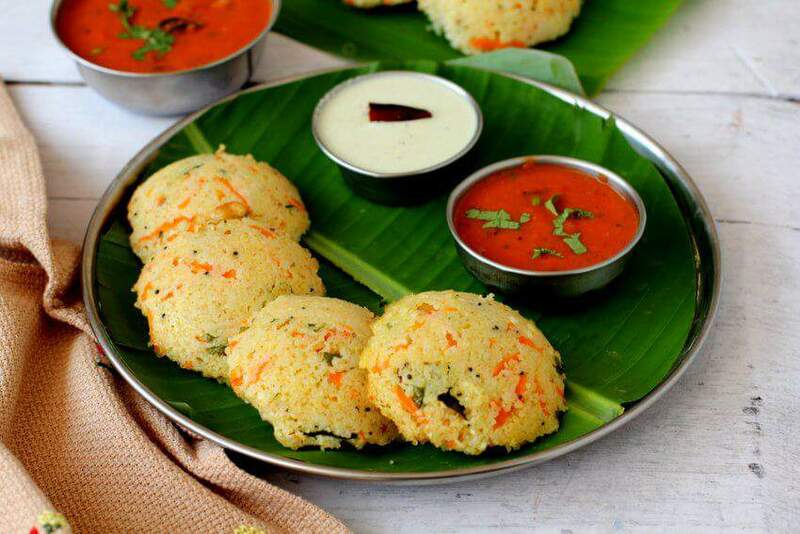 Wheat rava idli recipe falls under the category of an easy and healthy breakfast dish. Like idli, South Indian steamed rice cakes, it makes for a lighter, but equally delicious option. These vibrant, carrot-flecked, visually appealing steamed beauties are a breeze to make. 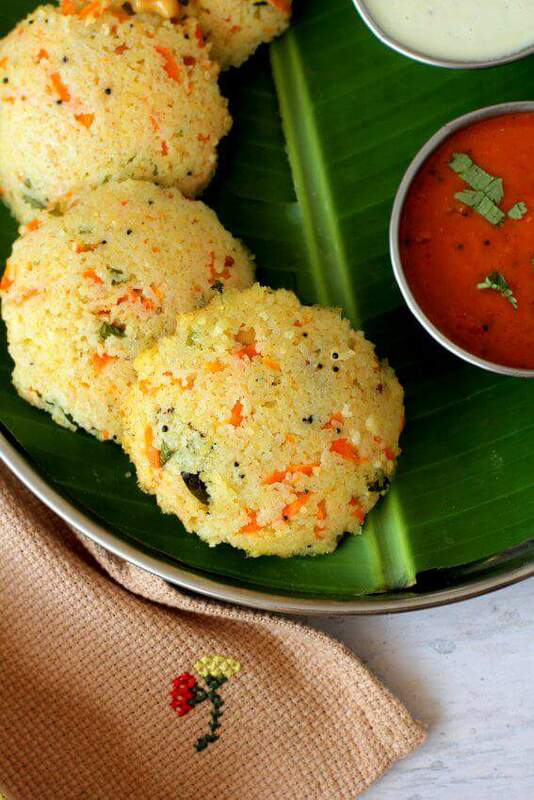 In fact, the vibrant colour of this instant wheat rava idli is due to the addition of carrot and not turmeric powder. Wheat rava or broken wheat is called ‘dalia’ in hindi and ‘godhuma rava’ in telugu. Like dhokla, this instant dalia idli is a steamed preparation that requires no fermentation. All you have to do is mix everything together, allow the wheat rava idli batter to sit for a few minutes for the flavours to meld, pour the batter into greased idli plates or cups and steam till done. Sour curd lends a subtle tangy flavour while fresh green chillies and ginger spice up the idli. Coriander leaves add a fresh colour and a pleasant herby flavour. The tempering of spices like mustard seeds, aromatic curry leaves and asafoetida in ghee pulls it all together. You can add some roasted cashew nuts along with the tempering. The wheat rava idli recipe does require some preparation where you need roast the wheat rava and grate carrots or fresh coconut. But the roasting of rava goes a long way to building depth of flavour. You can use samba coarse wheat and dry roast it on low flame till you get a pleasant aroma. Use sour curd and if you do not have sour curd on hand, use curd and some lemon juice. 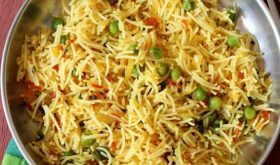 You can throw in shredded vegetables like carrot, beetroot or fresh coconut, green peas or any vegetable of your choice. Eno salt or citric acid is added to the prepared wheat rava idli batter just before pouring it into the greased moulds. Adding Eno salt will give fluffy and airy wheat rava idlis. You can steam the batter in greased idli plates. 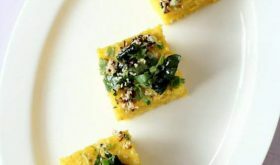 Alternately, you can steam it in a greased stainless steel vessel like you would do for dhokla. Once steamed, cut into square pieces and serve. 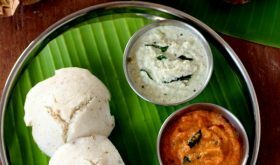 You can serve with a side of your favourite chutney like tomato chutney or coconut chutney and turn the wheat rava idli into a comforting morning meal. I served the godhuma rava idli with hotel style coconut chutney and Tamil Nadu style thakkali chutney (tomato chutney). This fibre rich breakfast dish is a gem among instant idli recipes and also makes for a quick evening tiffin or a light dinner. You can also check out instant rava idli recipe (semolina based rice cakes) that I have blogged earlier. Heat a heavy bottomed vessel, drizzle a few drops of ghee or oil. Add the broken wheat and dry roast it for 5-7 minutes on low flame. Remove from heat and place in a bowl. In the same vessel, add ghee. Once hot, add mustard seeds and allow to splutter. Add the urad dal and allow to turn red. If using broken cashew nuts, add them and roast till red. Add asafoetida and curry leaves and roast for a few seconds. Add the grated carrot and stir fry for 4-5 minutes and turn off heat. Wash the roasted dalia or broken wheat. 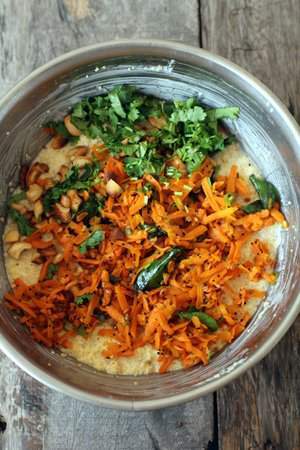 Add the tempering and stir fried carrot mixture to the roasted broken wheat along with chopped coriander leaves. Add the sour curd and salt and mix well. Add a little water (approx 1/3 cup) to make a smooth thick batter. It should not be too thick nor too thin. Cover and set aside for 20 minutes. You will find that the water is absorbed by the broken wheat. Add more water (as required) to make thick yet flowing batter. Grease idli plates and add 2 cups water to your cooker or steamer and place the vessel on low flame. Add eno salt to the prepared wheat rava idli batter and mix in one direction. The batter will increase in volume slightly. 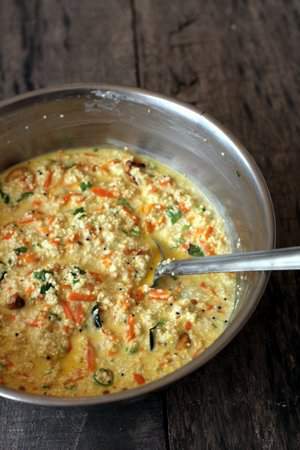 Immediately, pour the batter into the grease idli plates and steam for 15-17 minutes. 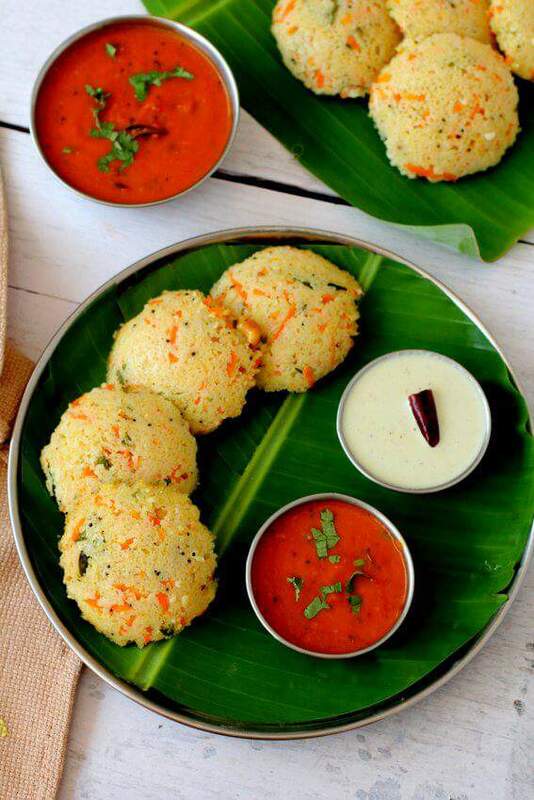 Turn off heat, remove the wheat rava idlis to a serving plate and serve with any chutney of your choice. If the wheat rava or broken wheat is not too fine, you can grind it for a few seconds to make it slightly finer. Grind the rava after dry roasting it. 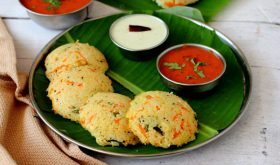 By Sailu Category: Indian Breakfast Recipes Published: April 3, 2017 Wheat rava idli recipe, an easy, healthy steamed cake made with broken wheat or samba wheat. How to make godhuma rava idli or instant dalia idli. Any other options or replacement for ENO salt.. don’t want to add ENO for my little one. Any other options?? I am afraid there is no replacement except baking soda and citric acid. Since you are cooking for your little one, use sour curd and add at least 2 tbsps of lemon juice while preparing the batter. Allow the batter to rest for a longer period of at least 1 to 2 hours.